It’s probably too early in the day for me to playing Overwatch, being around noon. After all, I have work to do. But I’m ignoring that for now. For a fleeting hour or so, I’m taking a break, because Overwatch’s latest themed event is here. And oh buddy, it’s Halloween. A couple hours spent in Overwatch’s Halloween Terror event and I already feel as if it’s leagues better than the Summer Games from August. Maybe that’s because I’m not into sports, but skulls and pumpkins? I’m 100 percent on board. In the timely update, players can now buy the rare skins they most desire using in-game coins (just be prepared to spend a pretty penny for it). The best skins and sprays of the bunch obliterate the sportiness of the last event’s Olympics-themed wear. The Hollywood map is now adorned with spooky décor and overcast skies, making it more ghastly than before. And best of all: no Lucioball in sight! Instead, there’s a brawl that’s actually fun to play! And it’s a horde mode with difficulty levels. Overwatch’s latest brawl, “Junkenstein’s Revenge,” is, as I stated above, a horde mode for four co-operative players, the only available heroes being Ana, Hanzo, McCree, and everyone’s daddy, Soldier: 76. Together, the four well-versed acquaintances defend the castle in the Eichenwalde map against an onslaught of robotic Zomnics, Pumpkin King Reaper, Dr. Junkenstein, Junkenstein’s Sad (keeping with Mary Shelley’s classic novel) Monster (also known as Roadhog), and the Witch (or, Mercy). There’s even a new digital comic to celebrate the occasion. But I guess not all players will find themselves enamored with yet another horde mode, since Gears of War 4 did just come out to scratch that horde-slaughtering itch. Alas, we all know the best part of any themed event: the skins. To reign in the momentous occasion, here’s the best eerie outfits for our favorite heroes (even if I’m still sour on the omission of a giant jack-o-lantern piloted by D.Va). 12. Soldier: 76 looks like he forgot about his invite to a Halloween party, but luckily had some ghostly make-up and a very Thriller-esque jacket lying around to make up for it. 11. Well, at least Symmetra’s tights are kinda spooky. 10. Okay, Hanzo’s demonic skin isn’t that great either. But he’s one of my mains, so if I get it I’m bound to equip it. 9. Iridescent Zombie Pharah looks nice, finally an excuse for me to unequip those godawful Native American skins. 8. I don’t usually like any of Ana’s skins that cover her face—I want to embrace the grandma—but at least she has this adorable candy giving emote. I’d like some sour gummy worms please, scary grandma. 7. 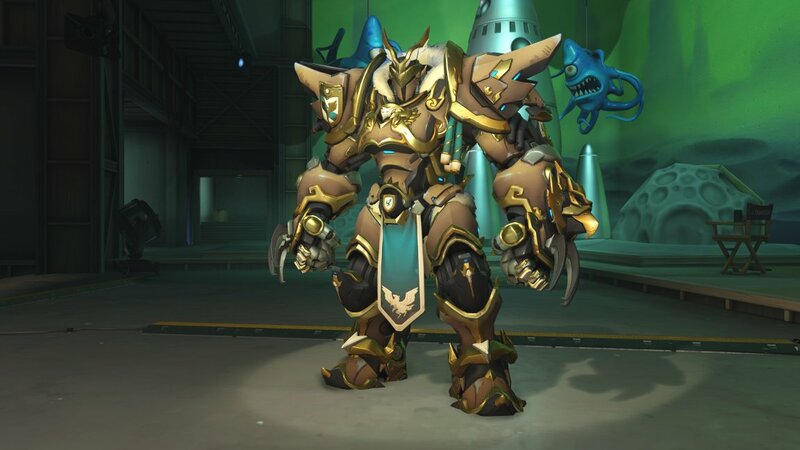 Reinhardt officially has too many good skins. 6. R.I.P. to all those who cross the deadly Bastion’s path. Pour one out for all the heroes with no festive skins. 5. I never knew I wanted Skelly Zeny until this very moment. God bless. Discord orb me, bone daddy. 4. & 3. Roadhog and Junkrat are a match made in heaven. A “ship” as netizens may say. Or an “OTP.” And with these equally grotesque skins, they remain. 2. If it lives, Pumpkin Reaper can kill it. 1. Here it is, the winner of this ranking. The crème de la crème. The witch who will Guardian Angel-glide straight into my heart, before whipping out a pistol to destroy any enemies in our wake. I love her. I’m sure you do too. Overwatch’s Halloween Terror event is available now. Everybody scream! It’s Overwatch on Halloween.